Williams’ Percent Range Divergence Indicator Generation III is modern indicator with complex mathematic algorithm (BJF Trading Group innovation). You will see divergenses on the chart and indicator. Arrows painted above/below the open bar and not in the past. You can see when actually you can trade. It is never to late! Signals based on closed bars so the arrows above/below open bar never disappear. Williams’ Percent Range Technical Indicator (%R) is a dynamic technical indicator, which determines whether the market is overbought/oversold. Williams’ %R is very similar to the Stochastic Oscillator. The only difference is that %R has an upside down scale and the Stochastic Oscillator has internal smoothing. To show the indicator in this upside down fashion, one places a minus symbol before the Williams Percent Range values (for example -30%). One should ignore the minus symbol whenconducting the analysis. Indicator values ranging between -80 and -100% indicate that the market is oversold. Indicator values ranging between -20% and 0 indicate that the market is overbought. As with all overbought/oversold indicators, it is best to wait for the security’s price to change direction before placing your trades. For example, if an overbought/oversold indicator is showing an overbought condition, it is wise to wait for the security’sprice to turn down before selling the security. 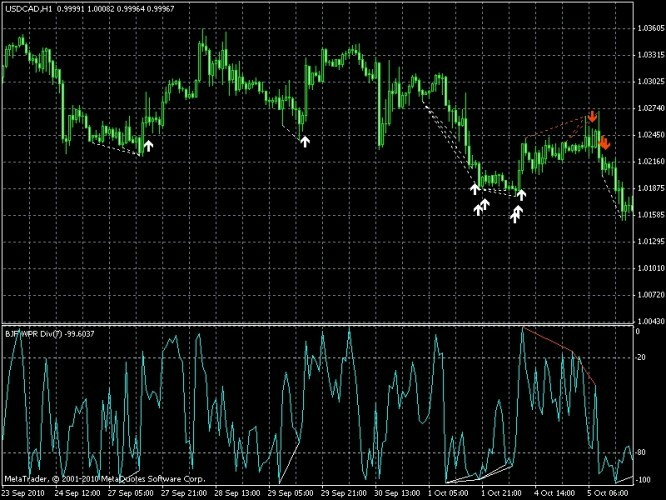 Williams’ Percent Range Divergence MT4 Indicator shows fractal divergence by Williams’ Percent Range MT4 indicator . When divergence arises between Williams’ Percent Range MT4 indicator and the price it means forthcoming end of current trend. The signal to buy comes when new Low-fractal is below the previous one, and corresponding Williams’ Percent Range meaning is above the previous one The signal to sell comes when new Up-fractal is above the previous one and the corresponding Williams’ Percent Range meaning is below the previous one. The indicator has a lot of customizable settings.